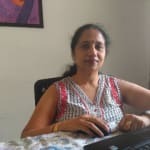 Dr. Neena Luthra is a distinguished Dietitian/Nutritionist in Chandigarh who has an experience of 22 years in treating patients with care and compassion. She has done B.Sc. (Home Science) from Punjab University in 1995, M.Sc (Dietetics /Nutrition) from Kurukshetra University in 1999 and a P.G. Diploma in Nutrition & Dietetics from Govt. Home Science College, Chandigarh in 1996. She has been a Dietician at Govt. Medical College Hospital, Chandigarh and Dietician at ‘Get Fit with Neena’. She is a professional member of India Dietetics Association and Indian Society of Parenteral and Enteral Nutrition. Dr. Neena Luthra is valued for providing services like Weight Management, Aromatherapy treatment, Diet Therapy treatment, Weight Loss treatment, Nutrition Assessment Service, Customised Diet Chart, Child Nutrition Management, Allergy Tests, Diabetic Diet Counselling, treatment of Food Infection, Immunity Therapy treatment, Slimming treatment, Sports Nutrition, Ketogenic Diet treatment, Therapeutic Diets treatment, Asthma treatment and Management, Food Plan Preparation and Guidance Lifestyle. Dr. Neena Luthra is available at Nutrisolution-the Diet Clinic, House No. 1582, Sector 18D, Chandigarh.